Film dubbing is a lost art. Many of us look back fondly to the time when every kung-fu movie, Italian horror flick and foreign film outside of the arthouses was voiced by a parade of gruff, bored-sounding Californian ‘voice artists’. But those days are gone: even trash is subtitled now. Which makes the likes of ‘A Turtle’s Tale’ something of a throwback: an animated film made in Belgium but re-voiced for the British market, this drab, predictable family adventure is enlivened no end by the hilariously inappropriate voice cast the producers have roped in. It starts with John Hurt in full fireside-chat mode as the voice of Sammy, a kindly, ageing sea turtle looking back over a life spent roaming the oceans of the world: cue flashback, as Sammy is born, makes friends, falls in love and is adopted by a VW-driving Californian hippy who talks like a member of the ‘EastEnders’ cast. Yes, wherever Sammy goes, everyone he meets is English: sharks, seagulls, even an American cop. The result is like ‘Finding Nemo’ meets ‘Eurotrash’, only not quite as fun as that sounds. 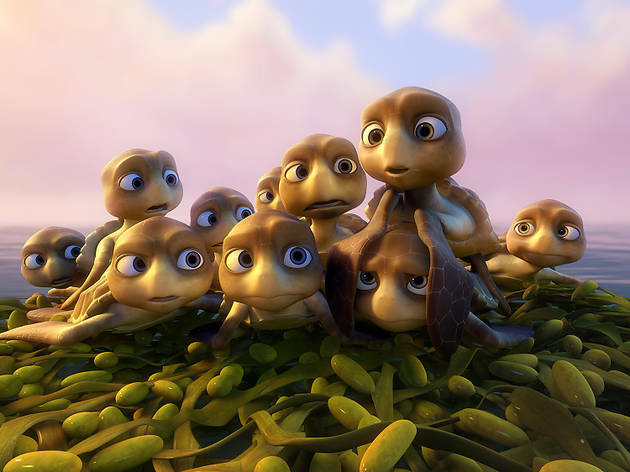 Elsewhere, there’s little to recommend ‘A Turtle’s Tale’: the characters are thin, the dialogue is bland and the animation is plasticky, though the 3D effects are sometimes interesting in a lurid, sub-Pixar fashion. It’s all tied together with a blunt, patronising ecological message about protecting wildlife and respecting the oceans. Respecting the audience is lower on the agenda. This is for children under 6. After that, they can understand how poor of a movie this is. This was the cutest film, worth the time to spend with your family, children don't know if it is copied from another film and this film has a lot of different aspects to take the time to talk to our little souls soon to be the future of this world the importance of different issues, like keeping our oceans clean! My there year old got the point of what I've been trying to teach him, it's nice for them to see it from Sammy's point of view! Loved it and more importantly my 1 & 3 yr old did as well! IM so glad I purchased it HD worth the 12 bucks for sites! It was cute. My kids loved it! The music is amazing! Really wish I could find a song list or soundtrack somewhere but not having any luck :/ if anyone knows where to find it please let me know! I love this movie and so does the rest of my family! It is so cute and we all love the music! 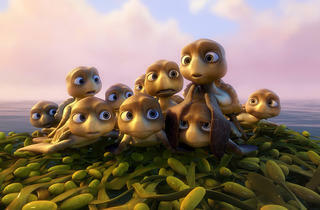 I love this movie and so does the rest of my family!It is so cute and we all love the music! True, lots of elements are copied, but those aspects work and make kids and me happy, so who cares? It's looks beautiful. It's got great music (that I still can't the soundtrack to). Good story, one I don't mind watching a few times with my two year old. Happy kid. Happy mom. This is a great film. My entire family loves it and my children watch it over and over. I think it is well made and the music is really good. In fact my children have asked me to get a soundtrack to listen to in the car. Highly recommend this film. My daughter loves this movie and I agree, it was educational and fun. Avoid. This film is a waste of your and your kids' time. Everything is ripped off from more popular and better-made films. Every second one can almost hear the producers thinking "ok, what could we now use that's been already used and proven to make money in the past 10 years?" Music, dialogue, "characters", it's frankly horrible. Feels like buying a fake guitar with battery-produced sounds for the price of a classical instrument.